It is always interesting to meet with a new client and to hear their story. During the first several meetings—usually with the decision makers—you try to discover and understand the issues. What are the things keeping them awake at night? This knowledge will help you to design and deliver great workshop sessions. Clients are not always sure of exactly what they want or need, or how you can help. They may find it challenging to tell their stories—they may be embarrassed or have difficulty summing it up. Sometimes it is just because they are so bogged down in their own work. No matter how carefully you craft the questions, your client may feel overwhelmed and have difficulty explaining the problems. They may also have trouble understanding how an outsider can address the issues, especially when they show up armed with a box of LEGO® bricks. This is why we created the 3D Diagnostic Cards. When we hand clients a deck of 25 cards they are quickly able to sort the cards into decks and identify their big rock issues. Why do the cards work so well and so quickly? The cards provide the brain with a visual that allows it to tell the real story. The pictures are humorous, which makes it easier for people to own up to the biggest issues they face. The sorting process we use also provides a quick way for clients to pinpoint their biggest issues and concerns, within minutes instead of hours or days. Not only can clients identify their issues quickly, but they can also see we have addressed these issues before. They know we won’t judge them. The cards let them know we get it. 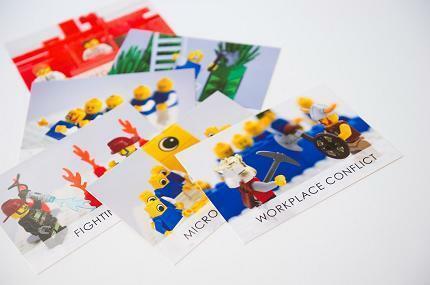 The cards help build confidence, as clients can now see how they can use the LEGO® bricks to tell all kinds of stories. The cards are in fact an excellent sales tool. The use of the cards allows clients to join you as a partner as you design the workshop. You are not guessing or hoping for the best, you are using a tool that uncovers information. The cards are a great tool for illuminating issues your clients are facing right now. 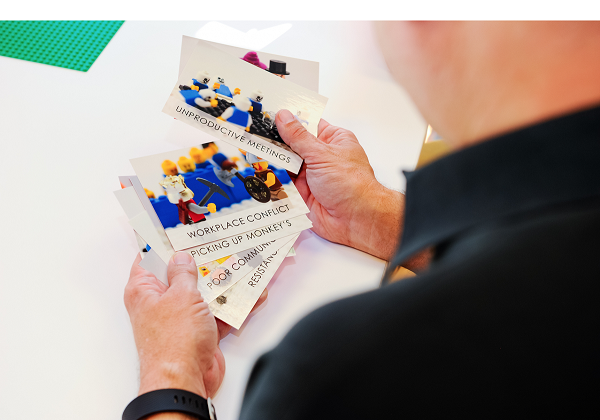 People love LEGO® but LEGO® SERIOUS PLAY® methodology is not a game. It works on complicated problems that need to be addressed. When businesses and organizations hold an off-site or an engagement, they want to be sure they are making the best use of their resources. You can help them by utilizing powerful tools like the 3D Diagnostic Cards. Our Diagnostic Cards are a great way to help you design powerful workshops that deliver results. See and Hear how you can use the cards in your own practice - available now!